Without a fuzz, a widely wanted feature sneaks into Google Buzz. 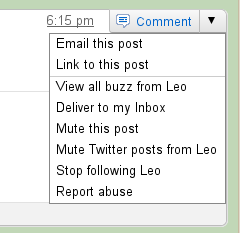 You can now mute a specific service for a User. If you click on the right drop-down menu of a post, you can now select e.g. "Mute Twitter posts from ..." to stop receiving updates sent via Twitter from that particular person. This works not only with Twitter, but for all kind of postings. You don't want to see someones blog-postings? No problem. Don't like Videos in your stream? Get them out. This is enjoy many users and gives a way to filter their Buzzes a little bit. But be careful. If you use this too much, you might miss some important stuff. You could end up in an even more boring time-line, if you filtering out too much.